A North Carolina Republican says he'll vote for her. 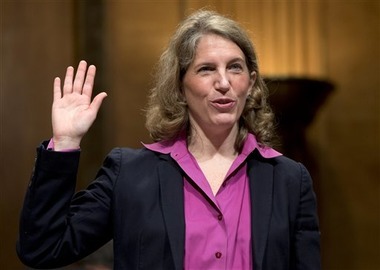 (Bloomberg) – Sylvia Mathews Burwell defended the Patient Protection and Affordable Care Act (PPACA) today at a congressional hearing. Burwell — President Obama’s pick to succeed Kathleen Sebelius, the outgoing Health and Human Services (HHS) secretary – said PPACA has given millions of Americans new benefits. She said the law has also improved federal government finances. “For the period from 2014 to 2020, health-care costs by the federal government have decreased by $900 billion,” Burwell said. Burwell, a former director of the Office of Management and Budget (OMB), appeared before the Senate Health, Education, Labor and Pensions Committee. The Senate HELP will not vote on the Burwell nomination. The Senate Finance Committee, which will vote on the nomination, has not yet scheduled a Burwell hearing. The next HHS secretary will have a major role in shaping HHS implementation of PPACA, and on HHS programs that serve the elderly and people with disabilities. The Senate voted 96-0 less than a year ago to confirm Burwell in the OMB post. This week, she has been meeting with senators to round up HHS confirmation vote support. At today’s hearing, one Republican senator, Richard Burr of North Carolina, said he plans to vote to confirm Burwell. Sen. Lamar Alexander, R-Tenn., asked Burwell if she would support letting holders of non-PPACA-compliant health insurance keep their coverage after the current two-year grace period ends. “At this point, I think we want to see what’s happening with regard to the issues of implementation,” Burwell said. Sylvia Mathews Burwell: The next HHS secretary?